I'm a former preschool and kindergarten teacher with a master's degree in special education. 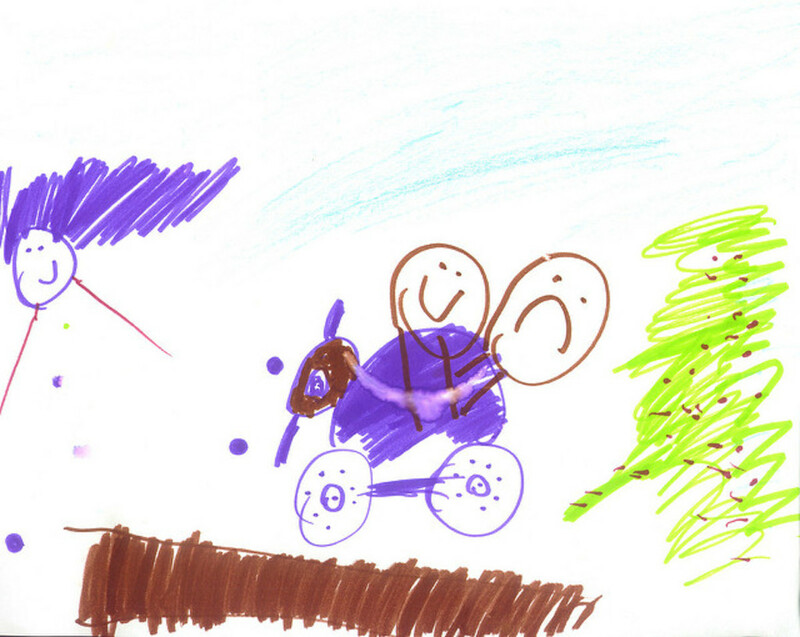 I write on issues in early childhood education. Do you think the primary goal of preschool is to prepare children for kindergarten? Do you believe “earlier is better” when it comes to academic instruction? Do you think the current emphasis on academic learning at preschools in the United States is supported by research? If you're nodding in agreement, you're one of many in our country who's bought into the false notion that early academic rigor results in smarter youngsters and a better society. While parents in other countries celebrate all the stages of their children's development, we must ask ourselves why we want our kids to race through them. Our vision of an ideal preschool—children painting at easels, playing dress up, riding tricycles, and digging for dinosaur fossils in a sandbox—is slowly fading away. In its place, we have academic preschools that reduce the once-broad scope of early childhood education to one goal: preparing youngsters for kindergarten. Large-minded objectives such as getting kids excited about learning, helping them build friendships, and promoting their wonder about the world around them have been eclipsed by narrow skills such as reciting the alphabet, writing numbers, knowing letter sounds, and counting to 100. If you're a parent with a myopic vision for your preschool children (getting them ready for elementary school), today's academic preschools will satisfy you just fine. However, if you have a long-range vision for your youngsters (helping them become healthy, creative, independent-minded, and well-adjusted individuals and contributing members of society), today's academic preschools will leave you sorely disappointed. I have loved my life's work...So never in my wildest dreams could I have foreseen the situation we find ourselves in today. Where education policies that do not reflect what we know about how young children learn could be mandated and followed. We have decades of research in child development and neuroscience that tell us that young children learn actively – they have to move, use their senses, get their hands on things, interact with other kids and teachers, create, invent. — Professor Nancy Carlsson-Paige, child development expert and author of "Taking Back Childhood"
Before our country loses something so precious and profound as our play-based preschools, experts in child development are doing their darnedest to sound the alarm. The best and brightest in the field are warning that academic preschools will result in youngsters who are less creative, less curious, and less capable of critical thinking. This will have dire effects for them as future employees, parents, and citizens and pose grave consequences for our democracy. Recognizing this crisis in early childhood education, experts in the field have formed a coalition called Defending the Early Years. Their goal is to advocate for practices at preschool that have been proven beneficial to young children. These include play, exploration, hands-on learning, social interaction, sensory activities, and real-world experiences. They criticize current practices that are not developmentally appropriate and cause young children needless stress, confusion, and frustration: teacher-directed lessons, long circle times, paper-pencil tasks, assessments, rote memorization, technology, and standardized tests. 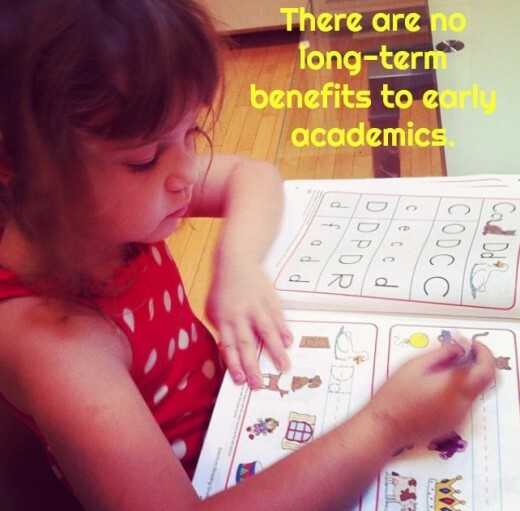 The Experts Say: "No Benefits to Early Academics!" The mission of Defending the Early Years is to inform parents of young children and the public at large about the importance of letting kids be kids. They want people to realize there's no benefit to early academics, but there are indeed many drawbacks. Lilian G. Katz, professor emerita of early childhood education at the University of Illinois writes: "While early formal instruction may appear to show good test results at first, in the long term, in follow-up studies, such children have had no advantage. On the contrary, especially in the case of boys, subjection to early formal instruction increases their tendency to distance themselves from the goals of schools, and to drop out of it, either mentally or physically." Bill Gates is wrong. American education is not 'broken.' Federal education policy is 'broken.' Testing children until they cry is a bad idea. It is educational malpractice. America's preoccupation with speeding up learning has resulted in an escalated curriculum, meaning activities once reserved for older students are now used with younger ones. While some parents are easily impressed by their children's early acquisition of academics, they're often woefully ignorant of the harm it does. The negative effects of an escalated curriculum, however, have been researched and documented by experts in early childhood education and include increased stress levels, higher incidences of aggressive behavior, acting out, and a particularly disturbing phenomenon: the expulsion of little children from preschool. An escalated curriculum asks young children to behave in ways that are unreasonable at their tender ages. When they're unable to do so—getting frustrated, acting defiant, and refusing to participant—they're labeled troublemakers, hyperactive, and socially immature. In fact, three and four-year olds in state-financed preschools are expelled at three times the national rate for K-12 students (boys much more so than girls, blacks more so than whites). We shouldn't be asking: What's wrong with these little kids at preschool? The appropriate question is: What's wrong with our preschools? Finland is known across the globe for its outstanding education system and other countries seek to duplicate its success. The Economist Intelligence Unit (EIU) conducted a study in 2012 to assess the education systems in 50 countries, taking in consideration factors such as standardized test scores, literacy rates, and graduation rates. Finland ranked number one while the United States was 17th. You'd think, therefore, we'd be wise to follow Finland's lead in early childhood education but, no, we stubbornly insist on doing the very opposite. Eeva Penttila, head of international relations for Helsinki's educational department, says this about Finland's early education: "The focus...is to 'learn how to learn.' Instead of formal instruction in reading and math, there are lessons on nature, animals, and the 'circle of life' and a focus on materials-based learning." 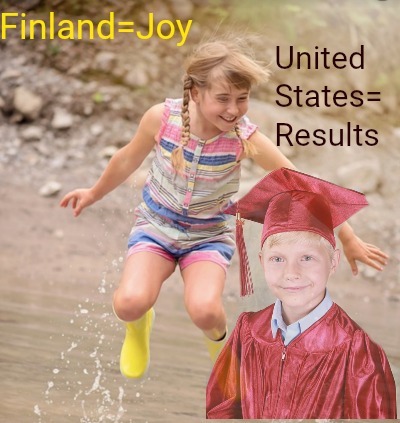 Sadly, here in the United States we concentrate on narrow academic skills rather than developing the whole child—body, mind, and spirit—as they do in Finland. Children in Finland don't receive formal academic instruction until age 7. In the United States, we now give structured lessons, assessments, and standardized tests to 4 and 5-year-olds at preschool. While Finland's preschools are child-centered with play, exploration, and hands-on learning, ours are adult-centered with long circle times, workbooks, calendar activities, and formal lessons in STEM (science, technology, engineering, and math). Preschool teachers are esteemed in Finland but not in the United States where they receive low pay and hold low social status. Preschool teachers in Finland have lots of autonomy while those here have much less. Preschool teachers here are increasingly constrained by the intense pressure to prepare children academically for kindergarten. Joy is the foundation for teaching young children in Finland. Their teachers have broad long-term goals: to promote enthusiastic life-long learners who can think for themselves, work well with others, use their imaginations, and solve problems in creative ways. Joy has been taken out of the equation at many preschools (especially publicly funded ones) in the United States where children must score well on standardized tests and be academically ready for kindergarten. "Sadly, the worst of the restrictive, standardized, drill-based education is happening in our poorest communities. More often the teachers in these underfunded schools have less training. They are more dependent on the standardized tests and scripted curricula and more willing to impose them. These teachers haven’t learned what they could do instead of the drills and tests, and they haven’t learned how harmful these approaches are for kids. "I wish you could see the faces of kids in the low-income communities I visited this year. They are scared, sad and alienated. I see on them an expression that says, 'School is not fun, and it is not for me. I want out of here.'" Childhood is not a race to see how quickly a child can read, write, and count. Childhood is a small window of time to develop at the pace which is right for each individual child. In the United States today, we've tried to silence those who've spent a lifetime working with and studying young children but, luckily, their voices can still be heard. We've pushed common sense to the side and replaced it with fear—fear our children won't be smart enough, fear they won't succeed at school, fear they won't get good paying jobs. We've let these worries overcome us, stopping us from doing what's best for our youngest, most vulnerable learners. In his article The Decline of Play and Rise in Children's Mental Disorders, Dr. Peter Gray makes it crystal-clear that our kids and our society are paying a high price for early academics. He links the increasing rates of depression, anxiety, narcissism, and suicide among our children and teens to the decline in free play and exploration. With too many teacher-directed lessons and not enough opportunities for kids to be kids, our young people are experiencing a loss of control which, in turn, makes them feel down and disheartened. Preschoolers in Finland are fortunate to have adult leadership that advocates for joyful learning. Sadly, our preschoolers in the United States don't and their joy is eroding, creating long-term problems for them and for our society...but, at least, they can count to 100. Why do you think Americans want to speed up the developmental process? If you want to know what we're doing wrong in early childhood education today, this is the book to read. Nancy Carlsson-Paige is an outstanding advocate for young kids and is knowledgeable about how they learn best: imaginative play, exploration, hands-on materials, and a child-centered environment. I highly recommend parents read this book before deciding on preschool or homeschooling. How does early education make children do poorly in school later in life? A preschool education hurts children at school (and in life) when the scope of instruction is too narrow and the goals too limiting. A good preschool is all about expanding the child's universe through play, hands-on learning, exploration, and socializing. A good preschool teacher wants her students to get energized about learning, knowing it comes from their own curiosity and is not spoon-fed to them by an adult. Unfortunately, play-based preschools are dwindling. Because of the academic rigor in the primary grades, parents want their kids prepared for kindergarten. This preparation includes writing in workbooks, sitting still for long teacher-directed lessons, learning letter names and sounds, and learning how to count and recognize numerals. There is no evidence that teaching these skills early has any long-term benefit. There is evidence, however, that it causes stress and turns kids off to school. We are seeing higher rates of depression and anxiety among children and the lack of play in early years is one likely culprit. Parents and teachers need to look at the big picture of education so kids will become life-long learners, knowing how to think critically, work cooperatively, and solve problems in creative ways. These are all more important than knowing that "t" makes the "tuh" sound. How do we prepare for kindergarten if our child does not attend Pre-K? You have the power to make learning fun and interesting for your child by tapping into her curiosities. Instead of enduring a month-long unit on dinosaurs or planets (for which she has no passion), you can focus on what intrigues her, whether it's dogs, cooking, making vehicles, or rainforests. She'll have plenty of time for a standard curriculum in the years ahead, but early childhood education needs to be individualized. All learning should stem from her interests in an organic way. Reading books about what interests her will make all the difference in the world. Good reading involves "scaffolding," finding out what she already knows on the topic and building from there. Unlike a preschool teacher with 20 kids, you can stop during reading and ask her questions, see if she's comprehending, and relate what you read to her own life experiences. That's so powerful compared to kids sitting criss-cross applesauce and zoning out while the teacher reads! Of course, real-world experiences are best for productive learning. Taking your child to the market introduces her to so much as she counts apples into a bag and weighs them on a scale. She can investigate the different varieties of apples, and you can make apple juice, apple pie, or caramel apples. The possibilities are endless. Preschool learning has become so narrow because parents want their kids prepared for kindergarten. This is truly tragic because preschool should be expanding their world and preparing them for life. There's no long-term advantage to the academic rigor we're imposing on young children. There are only negatives: less creativity, less critical thinking, and more depression, anxiety, and suicide. I hope that parents will see the folly in our country's preoccupation to prepare preschoolers for kindergarten. Research shows the early years should be about play, exploration, communication, and socialization, not workbooks, circle times, and teacher-directed lessons. What do you think of parent-teacher co-ops for preschool? A co-op preschool typically has one paid employee, the teacher, and a handful of parent volunteers who run the activity stations. The parent helpers take turns working at the preschool (typically 1-2 days per month) as a requirement for their child's attendance. There is a parent board (elected by the other moms and dads) that makes decisions on school policy such as the cost of tuition, food choices for snack time, fundraising efforts, and upkeep of the facility. The teacher makes the day-to-day classroom decisions: curriculum, discipline, daily schedule, and field trips. The advantages of a co-op preschool are numerous: the incredibly low adult to student ratio (something like 1 to 5), the commitment of like-minded parents who believe their involvement makes a huge impact in their children's education, the multitude of activities the kids get to experience each day, and the low cost compared to other programs. A co-op preschool is both democratic and transparent. It's an ideal place for moms and dads who want to meet other parents, set up play dates, and be involved in a tight-knit community. The primary disadvantage is that belonging to a co-op preschool is quite challenging for working parents unless they're self-employed or have extremely flexible bosses. In my current position, I visit dozens of early childhood education facilities each year, and I'm most impressed by the co-op preschools. The youngsters get a wide-range of experiences that are fun and developmentally appropriate because of the parent helpers. Children aren't cruelly subjected to practices that are designed for older kids such as writing in workbooks, sitting still for long circle times, and listening to boring lessons about the calendar and weather. They're constantly moving, playing, pretending, interacting, exploring, and communicating. At the co-op preschool, I visited last week, there was one parent who supervised outside while kids pedaled their tricycles and splashed at the water table. There was a second parent who assisted with the children painting at the easels. A third parent worked at the “sensory table” as youngsters explored a tub of cold colored spaghetti. A fourth parent helped with kids in the play kitchen, and a fifth was in charge of a group that was building with little hammers, nails, and pieces of wood. The teacher walked throughout the school, talking to the kids, asking them questions, and making sure everything was running smoothly. Everyone child was fully engaged, happy, and productive. It was what I would hope for every preschooler. I have an article called “Why Parent Should Choose a Preschool With a Strong Philosophy: Montessori, Waldorf, or Co-Op” (https://hubpages.com/education/Montessori-Waldorf-... that you may find helpful. Will this preschool situation get fixed if most parents start complaining about preschool? Without a doubt, parents are the solution to the current problem of academic preschools in the United States and should let their voices be heard. They are the consumers and wield all the power. 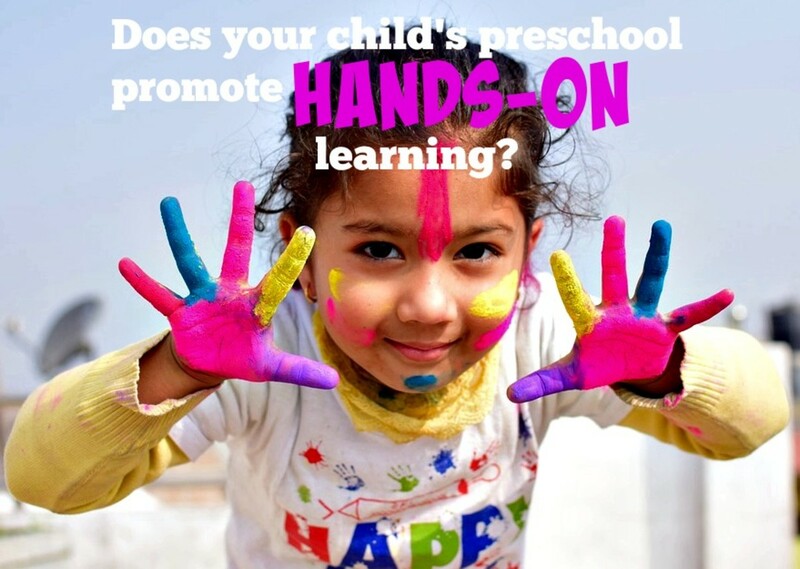 When they decide to finally take a stand for developmentally appropriate practices (children learning through play, social interaction, and hands-on materials), preschool directors will take notice and change. Preschool directors already know that academic preschools are misguided and go against everything taught in early child education classes. They want to stay in business, though, so they offer what parents are seeking—namely, academic preparation for kindergarten. Parents today seek academic preschools out of fear. They're worried their children will suffer if they don't attend a preschool that prepares them for kindergarten. Other moms and dads warn them that kindergarten is now what first grade used to be and that many kids begin the school year already knowing how to write their names, count to 100, and recognize the letters and sounds of the alphabet. Parents get scared that their youngster will be placed in the low reading group in kindergarten, feel dumb, and struggle with low self-esteem. While their concerns are not unwarranted, it's never wise to parent out of fear. Good decisions are based on intellect, not emotion. Most smart and well-informed parents know that a preschool should be play-based. They know it should be about making friends, learning social skills, and discovering the power of team work. They know it should be about curiosity, creativity, and critical thinking and not ABC's, patterns, number recognition, teacher-directed lessons, and workbooks. Today, though, it takes strong and determined parents to go against the tide of academic preschools and not worry about keeping up with the Joneses who send their kid to a preschool that teaches Mandarin, computer science, and yoga. They must reject what everyone else is doing and chart their own course. They might do this by sending their children to a play-based preschool, doing home-schooling, or setting up regular play dates with like-minded parents. They need to relax about getting their child prepared academically for kindergarten and look at the big picture—getting their child excited about learning. Thanks so much for your question. Parents in the United States are unique in their desire to have their children grow up so fast and learn so much at an early age. In other countries such as Germany, their preschools and kindergartens emphasize unstructured play. Academics aren't introduced until first grade. Their approach is a lot more respectful of children and how they develop. Hopefully, we'll soon return to that! What can I do to change the preschool system? I could tell you to write your state and national representatives, but I have done that myself with disappointing results—not even receiving a lousy form letter in response. The fact of the matter is most of our politicians know little or nothing about early childhood education, and it's certainly not a priority for them. Their ignorance on the subject is one of the reasons why we're in this mess in the first place. In their minds, academic rigor sounds good in 12 grade, 8th grade, 4th grade, and preschool with no distinction. They are clueless about the devastating effects a lack of play, creativity, and socialization in the early years has on young people and society. With that pessimistic message out of the way, I'm happy to say that the most effective way to help preschoolers is getting involved with the fantastic organization called “Defending the Early Years.” On their excellent website https://www.deyproject.org/, you can join their e-mail list, sign up for updates, and make a tax-deductible donation. There are wonderful articles written by leaders in the movement such as Dr. Nancy Carlsson-Page and Dr. Diane Levin, who advocate for play-based preschools and developmentally appropriate practices. There's information on how you can get involved. “Defending the Early Years” informs you of the issues and research in early childhood education so you'll feel confident about communicating them to others and becoming an advocate yourself. There are so many misconceptions that parents and the public at large hold that need to be set straight. Many misguided folks believe that kids today are smarter than ever before because of early academic rigor and technology. They don't realize that the decrease in play during the early years corresponds to the rise in serious health issues among children and teens: depression, anxiety, obesity, suicide, and narcissism. They don't realize the decline in creative and critical thinking. How does preschool cause a child to have a bad attitude towards education later in life? Career experts agree that it's imperative for workers of the future see themselves as life-long learners; always acquiring new skills and new information as the world around them changes rapidly. Unlike our parents and grandparents, they won't be staying in the same job for fifty years and receiving a gold watch upon retirement. They'll move from job to job, learning to adapt and getting new training. Now, more than ever, it's important that children develop a love of learning at an early age, because they'll need to continue learning throughout their lives. Preschool should be an empowering experience for children as they construct their learning and let curiosity be their guide. If they feel helpless at school (sitting still as the teacher talks, writing in workbooks, learning about things that have little meaning to them such as numerals and letters), they'll develop a bad attitude about learning. They'll see it as something outside themselves--something to please adults. A preschool teacher with a background in early childhood education (not K-12 education) understands child development. She knows that preschoolers have just transitioned from parallel play to interactive play and need plenty of time to socialize with one another, practice their new-found verbal skills, and use their imaginations. She knows the preschool years are truly special, not just a time to prepare kids for kindergarten. She sees preschool as the time to prepare them for life and get them excited about all there is to learn and discover. I've heard this same philosophy applied to children up to age seven. Would you recommend homeschooling kindergarten (which we are considering), or do you think the transition to the classroom at grade 1 is too sharp? Our pediatrician is concerned that our daughter will have a hard time adjusting by not being in preschool. It would be interesting to know if your pediatrician is also concerned about the number of young children in the United States today who are getting traumatized by school shooting drills. Thirty-nine states require lock-down active shooter drills, and some use simulated gunfire. While these drills are upsetting enough to older students, they're even more frightening for little ones who don't always comprehend the concept of a drill, even after it's been explained to them. I know this is not the subject of your question, but it just struck me odd that a pediatrician would be concerned about a loving and motivated mother teaching her child at home. You can offer your daughter one-on-one instruction and a curriculum designed to her unique interests and curiosities. How could that not be superior to being in a class of 20 children (some with behavioral/emotional/learning issues) who are all subjected to the same curriculum whether they're interested in it or not? Many people don't realize that home-schooled kids now have many opportunities to socialize. There are homeschooling groups that meet regularly in most communities. There are local play groups. There are parent co-ops. There are programs at public libraries. There are classes through parks and recreation (dance, gymnastics, martial arts) that are offered during the middle of the day, catering to the home-schooled population. I don't imagine you're planning on keeping your daughter isolated and will have plans in place for her to interact with other kids. You know your daughter better than anyone, have her best interest at heart, and know what works well for you and your family. Keep an open mind, check out your options, and know that you can always change course. I know your daughter is in good hands! should i send my kid to preschool? While dwindling in numbers, there are still some good options for preschools that emphasize play, hands-on learning, and socialization. You want teachers and administrators with a background in early childhood education (not k-12) who understand what's developmentally appropriate for preschoolers. Many K-12 teachers only see preschool as a means to an end (i.e., preparing a child for kindergarten). You also want a preschool with a strong philosophy (Waldorf, Montessori, co-op) that guides instruction, discipline, nutrition, and play. A shared philosophy creates a community of like-minded parents who want a similar experience for their kids, are willing to work for it, and don't expect an education to be served up on a silver platter from teachers. My older son attended a wonderful co-op where moms and dads took turns volunteering in the classroom 2-3 times per month. We also participated in monthly parent meetings when the teacher educated us about child development and what to expect at each stage. The motto of the school was "together we're better." All of us parents were committed to giving the kids a fun and enriching preschool experience as a team. This sense of community is also found in many homeschooling groups where parents come together to share resources, take field trips, and meet for play dates. I'm also excited about the rise of "forest schools" in the US. They're popular in the UK and let kids spend the vast majority of time outside, enjoying the benefits of nature. This technology-free approach is about promoting healthy, well-rounded individuals for life, not just preparing them for kindergarten. Don't you think that all poll questions asked are equally true? I think all three poll questions are true, but I favor the second answer (intense pressure for children to succeed academically) like the majority of voters. It's said that when we wake up in the morning, each one of us is confronted with this fundamental question: Will I approach this day with love or fear? The United States has chosen to approach early childhood education with fear while other countries such as Finland have chosen to approach it with love. The United States and Finland have the same long-established research in early childhood education at their disposal: that preschoolers learn best through playing, interacting with peers, doing hands-on activities, and following their unique interests and curiosities. While Finland embraces this research and uses it as the foundation for their preschools and kindergartens, we do not. We go against the research because we're acting out of fear—fear that our children will not succeed unless they're force-fed early academics. This collective fear is irrational, not grounded in reality, and isn't swayed by decades of research to the contrary. It's another sad example of the anti-intellectualism/anti-research/anti-knowledge bent that has taken hold in our nation of late. When I talk to parents of preschoolers, most of them say they'd like their kids to play, explore, and socialize at school. However, they're afraid that this will result in their children being unprepared for kindergarten and not being able to compete with their peers. Because of Common Core and other legislation (with no input from experts in early childhood education), the “big picture” of preschool has been reduced to simply getting kids academically ready for kindergarten. Parents' biggest fear seems to be that their youngster will wind up in the “low” reading group in kindergarten. They're willing to sacrifice what's best for their kids and have them subjected to pre-reading, math, and handwriting in preschool rather than play. I know we'll return to play-based preschools in the United States someday because the research supports it. I hope it's soon. What are your thoughts on Transitional Kindergarten? My son turns five this May, and I am not putting him in Kindergarten in August. He is a second language learner, and I just don't feel he'll be ready. But I am trying to decide if I should keep him in his play-based daycare or put in him in TK. First, let me congratulate you for waiting until your son is five before starting kindergarten. Sadly, kindergarten has become very academic with students learning to read, writing paragraphs, and doing teacher-led structured activities throughout the day. Many kindergarten classes are now all-day, and there's little time for play except at recess. Many classrooms no longer have a play kitchen, a puppet theater, or a dollhouse where kids can use their imaginations, which is so crucial for their mental and emotional well-being. Teachers spend a lot of time assessing students, even though studies show the results they garner are largely meaningless at this tender age. 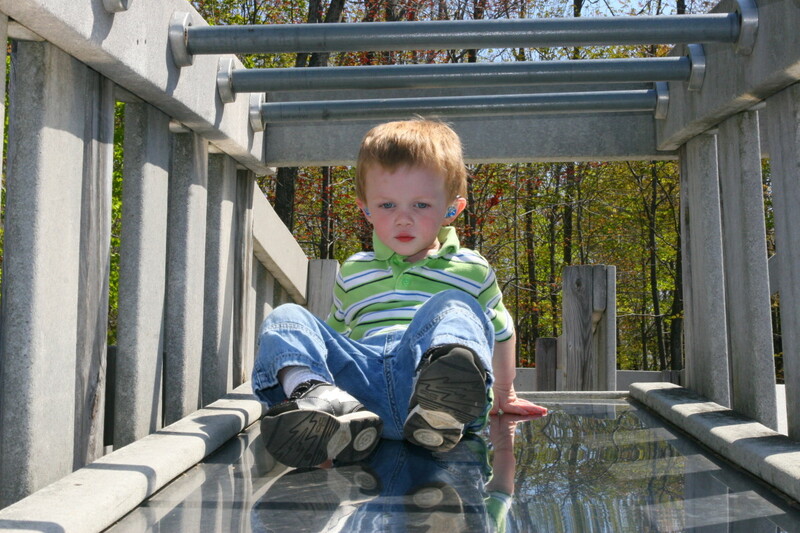 Young children, especially little boys, are not made to sit still for long periods of time. They need to move about, explore, and learn by doing. Their own curiosity should be their guide, not a rigid academic curriculum in which everyone learns the same thing at the same time. Unfortunately, too many parents today are getting the message from inexperienced kindergarten teachers that there's something wrong with their kids (usually boys) when it's simply not true. Their sons get labeled as “immature,” “hyperactive,” and “disruptive.” Some moms and dads even feel pressured to put their kids on Ritalin! Please share the link on your social media sites if you find it helpful. I want as many parents as possible to know about the dangers of America's early academic push! You have your head on straight, and I admire you for questioning what's happening in early childhood education today. Many outstanding preschool and kindergarten teachers have abandoned the profession because they know this crazy emphasis on early academics is detrimental to young children, and they want no part of it. It turns kids off to learning and has no long-term benefits. Studies show a child who learns how to read at 6 or 7 will be on the same level as the child who learns at 4 or 5 by the time they reach third grade. I know it's difficult to go against the crowd but continue to question everything. Make sure your son experiences learning as joyful and that his curiosity is stimulated. Becoming a self-motivated learner is far more valuable than knowing how to count to 100 and recite the alphabet and comes about through hands-on exploration, play, and social interaction. It cannot be spoon-fed by a teacher. I know your son is in capable hands. “Defending the Early Years” has a fantastic website with many articles on this topic. As a former preschool teacher and current ECE researcher I agree with the premise that play based learning should be the basis for preschool learning and that k-12 instruction being pushed down into preschool is extremely harmful. However, you have taken this sound and true argument and perverted it to support your own opinions. The answer to inappropriate instruction at the preschool level is not to just completely shut down. Preschools and homeschool all children. It is for parents and individuals with ECE backgrounds to advocate for appropriate instruction in preschool. You are also vastly underselling the social emotional benefits of effective preschool in helping children interact with their peers and in the world. Please don't take important and true information and use it for your own agenda. Olori, you are the voice of experience. Thanks for your dedication to early childhood education and thanks for sharing your wisdom. I so agree that too many preschool teachers today don't know about developmentally appropriate practices and give parents misinformation about what really matters in early learning. I totally agree with these articles. I think the poll questions should be almost equal. I had worked in the field of early childhood education for fifty years. There are many teachers who do not understand or have not had proper training in developmentally appropriate learning for young children. Teachers who work for Corporate daycares, some small centers as well as parochial or church based schools are pressured to teach academics as early as two years old. This is a sales pitch for large corporate daycares in particular . Parents are lead by this misinformation . Teacher who have had proper training are even pressured to push academics contrary to their education and belief system. It is important for us who believe in a wholistic approach in early childhood education to defend what we have learned, know and understand to be correct. It is important for the colleges who have educated us to not let our education be in vain and ultimately affect the development of the children today and tomorrow. I have the same situation as kristin. My boy is a very happy kid that is passionate about learning. He love letter and numbers sounds and writing when he was 2yr ...even before he started preschool. We never force him or teach him he just self learned form the puzzles and other toys at home. We initially decide to send him to school so he can catch up with the english ( we speak spanish at home) and becuase we felt he needed and extra motivation. His preschool is great, they have a lot of the learnings academic staff....like letters and calendar like you say, but they also have a lot of play time. They do cooking to promote team work and learning step working. To be honest he absolutely love it. He has grown so much socially and he made a lot of friends. Although he enjoy his paly time and even the soccer time....he is thrilled by the classroom time and learning his letter and numbers. I guess what I'm trying to say is that every kid is different and some of them are actually very exited to learn. My kid has been expose to the so called academic preschool but he is still avery creative kid, he is sociable and had no problem relating to others. He never had a tantrum and he is happy to go to school every day. So yes, i think preschool has been the best choice for him. And i don't agree that kids that learn early are less creative. Ofcourse i don't think that kids should be learning letter and numbers the hole day but i do believe is good for them to learn there is a time for everything. A time to play, a time to learn, a time to sleep....I have leave in other countries in Europe that rank among the highest educational systems and many of them put kids at preschool at age 3yr. This preschool include academic content even for 3yr old ...so i don't agree with this article at all. Falling Maple, your experience with your daughter's first preschool perfectly illustrates the problems with early childhood education today. All your daughter's behaviors were perfectly normal for a 3-year-old but were considered problematic by the preschool because of their unreasonably high student-teacher ratio. I'm glad your daughter is enjoying school now, playing with friends, and having fun. That's what preschool should be! Thanks for the thoughtful comments. My daughter goes to preschool, in fact, her second. She was kicked out by the first one when she first attended before turning 3 years old. They said, she didn't follow instruction: she didn't want to line up (as she tried to play hide & seek with teachers when recess was over), she ran around too much in the classroom (she did that when she was happy), she did not respect teacher as she hit teacher (she wanted to play with the toys while they repeatedly ask her to switch activities and she was frustrated), she broke school rules as she took off her shoes in the class (she was too hot with feet and did not like to nap with shoes, never mind, it broke the rule). It took long for her to fall asleep in her nap time (I had a second baby, she was stressed and hence not sleeping well) .... Ultimately, she turned from the fav kid in her daycareto an outcast in preschool as the teachers ignored her (though she made friends well there), and was acting rude, picking words, like "Leave me a lone." and I don't want to be your friend. She couldn't communicate very well when she joined the preschool but she managed to tell me that people told her she didn't make good choices ..... I would have switched her out if not because I was dealing with newborn and most schools go by academic year ..... but my husband thought we should have sent her for psychiatrist evaluation, so the whole preschool experience was a disaster and your article is refreshing. Few months fast forward, she is in the new school where teacher to student ratio was 1:6 instead of 1:12 or 1:24. Teachers are much loving and she is thriving again. The only time she talked about previous school was when she missed her friends. Ultimately, whether if it's called preschool, the key is the school should be flexible and make learning funs. My daughter still enjoys school as she gets to play with friends. While I don't believe in learning this young, but there is not much options if you are working mom, most daycares don't have kids around her age and they all go to preschool. Kristin, thanks for sharing a differing viewpoint. I'm glad your son had such a positive experience at preschool with time to play and socialize. Unfortunately, too many young children today (especially those in the inner-city) are enduring preschool experiences that are far too narrow. They're geared toward preparing kids academically for kindergarten but greatly limit (or even eliminate) crucial time for outside play, imaginative play, hands-on exploration, and the most important kind of learning of all--that which is discovered through one's own curiosity and desire. Dr. Peter Gray has studied the importance of play in mammals from an evolutionary standpoint. As youngsters' play has diminished in the past 50-60 years, he has noted the corresponding increase in severe emotional and mental issues in children and teens: depression, anxiety, narcissism, suicide, decline in empathy, and a loss of control over one's own life. An academic focus in preschool and kindergarten—knowing letter sounds, counting to 100, reading a paragraph—are not nearly as valuable as what's being lost—an enthusiasm for learning, skills to get along with others, the ability to solve problems as a team, the joy of discovery, and the hope that comes from knowing you're in charge of your destiny. Any preschool program that just wants to prepare kids for kindergarten is totally missing the point and is depriving little children of so much more. Thanks again for sharing your thoughts and experience. Enjoy your son! My child is an only child who never went to a babysitter or daycare other than a grandparents home while we worked. She is a retired preschool teacher and in fact they didn’t want to accept him in preschool because he scored a 16/16 on they things they’d asked him to do. BUT socially he needed to go to learn how to interact with other children not to mention our kindergarten is all day and I didn’t want to just throw him into school like that due to the fact that he’s very attached to my husband and I. He did a complete 180 and opens up so much better to new people and new situations. He will be in the 1st grade this coming year. Last year his kindergarten teacher saw that he was much more advanced than the kids in his class most of which did not attend preschool and was afraid he would get bored so she scheduled a time daily to do challenging work with him. This is something we left completely up to him because ultimately he was just in kindergarten and we didn’t want him to ever feel pressure from being challenged. He loved it! I think Preschool was one of the best things we could have done for him! I do not agree with this article at all! Tanu, I sent both my sons to preschool, but this was before the adoption of the Common Core standards and the current push for academic rigor in early childhood education. My older son attended a co-op that followed the tenants of the National Association for the Education of Young Children (NAEYC). It was phenomenal with lots of play, socializing, and exploration. It was all a preschool education should be. There are still preschools out there like that to be found, but they are dwindling in numbers. Parents are now picking preschools out of fear. They're worried that their child won't be ready for kindergarten if they choose a play-based one over an academic one. They hear other moms and dads talking about the high expectations for students entering kindergarten, and they don't want their youngster to be behind (which, of course, is quite understandable but not in the best interest of kids)! Although I wasn't a homeschooling parent, I know many parents who are. Their children are involved in numerous structured activities such as sports, acting, dance, and art and many unstructured ones as well. They belong to a homeschooling group that meets regularly in the park, at the library, and at one another's homes. Their children are not isolated in any way and have many opportunities to interact with people of all ages throughout the day. Hi, its nice you are homeschooling your child . But does it not affect your child ability to make friends and social skills ? Cynthia, even though you aren't an educator, you just perfectly articulated what the Swiss psychologist, Jean Piaget, discovered about early learning. He found that children 2-7 are in the "preoperational stage" when they learn best by tapping into their unique interests and abilities and following their own curiosities. Unfortunately, this is not happening in most U.S. preschools where a one-size-fits-all approach is standard. Our obsession with preparing students for kindergarten has ruined preschool for so many. The real-world experiences on your farm are far more valuable than any classroom education. Your son is discovering what real learning is while building a strong, healthy body and an ability to handle new situations--all with a loving and attentive mom to encourage and guide him. Those who are "offended" with your decision are probably motivated by fear--fear that your son won't be ready for school. They're not considering the overall well-being of your boy. The lack of play in the early years has led to an increase in anxiety and depression among children. Yes, they can now read in kindergarten but so what? It doesn't result in any long-term benefit. Cynthia, your son is so fortunate to have you. Enjoy every minute with him and always trust your instincts as his mom. They're very good! I really enjoyed reading this so much! I decided not to send my son to Preschool and I was amazed by how offended others seemed to be by my decision to let my son stay at home a little longer before the years of academic learning start. My son will be 5 in August and start school this year, though I find that he is much more intellectual than anyone who scoffed at my decision to keep him home imagined he would be. I was met with so many reactions from people thinking that I was harming my child with my decision to skip Preschool. We have a 65 acre farm so we are surrounded by learning opportunities at every turn. I am amazed at how fast he has picked up tending to our animals and their needs. We hike all the time, and he is fascinated by the things we see and learns a great deal about nature, not something that usually takes place in a structured setting . Children are amazing, and I wish our educational system was more geared towards fostering the areas that an individual child excels or shows a natural desire or talent for rather than the vigorous focus on merely test scores. I am not an educator by any means but it seems to me that our educational system and curriculum are so standardized that it is as if we are attempting to make duplicates rather than individuals. At 2 years old my son was already showing an aptitude for mechanics and engineering and today he still continues to take things apart and be able to put them back together. Children learn so much more through discovery, had I freaked out and micromanaged my 2 year old he would have never completely dismantled and then re-built a lamp. I was in view at all times and it was not plugged in of course but I think there is more to a child having some freedom to discover early on that facilitates their intellect much more than starting rigorous structured learning only preparing them for the next evolution of classes to come. Again I am in no way an educator so I may be doing rather poorly at describing my views on the subject. Joanna, you're so right; it's become so political and bureaucratic. Scholars in early childhood education have been silenced and those with no experience are making the calls. They now want preschool teachers who believe their primary responsibility is to prepare kids for kindergarten. Sadly, many parents desire that as well because they don't want their child to be "behind" when starting elementary school. There's such a crazy push for academic rigor in the early years but not later. I do think we'll move back to play-based preschools but not any time soon. A woman from Canada wrote me recently, saying that's what happened in their country. So there is hope! Kathryn, I think some well-informed parents of young children are starting their own mini-revolutions, choosing to homeschool their kids or send them to outdoor schools, forest schools, Montessori schools, Waldorf schools, and play-based co-ops. Now, parents who want their kids to play, create, and socialize at preschool are considered "fringe" while parents who want workbooks, teacher-directed lessons, and preparation for kindergarten are the norm. Our school district has opened some preschools, and they only want in-district teachers to apply. In other words, they only want K-12 teachers to get those jobs, not teachers with a background in early childhood development. They just want preschool to be preparation for kindergarten, and kindergarten for first grade, and so on. Too many parents are impressed with having a K-12 teacher as their child's preschool teacher when, in reality, they should want an early childhood educator. Kathryn, I love your passion and advocacy for young learners. It's a beautiful thing! I posted several months ago and have kept up with the comments on here. I'm glad to hear that so many believe as I do. I left teaching for many reasons. I was needed at home and when once again the rules changed and I came under fire for my belief on how children learn, I had no trouble deciding to walk away. I have my degree in Early Child Development. My state makes you do so many hours a year. The classes they had to offer me was a joke. All you had to do was show up and stay to the end to get your hours. I don't learn that way, so I took classes through Texas A&M, and to pass their test you have to use what you learn. But I was told those don't count. That I was not in compliance and was put under fire for it. But I still won't change. Children need to learn through play how to socialize with each other and that can't be done sitting down listening to a teacher all day. I love kids and miss it every day. So what I'm getting at is the system has gone to politics. A lot of teachers are there for nothing more than a paycheck. When I started teaching in 2000 things were a whole lot different. They expected you to care about the children and play with them. Not babysit or dictate them. But those ways are gone and I don't know if we can get it back. But we must keep trying for our children's sake. I am printing this article now. Thank You!!!!! I asked a question in the forums: who will start the revolution in education? Man, do we need one! If we don't, the kids are going to SUFFER. You're welcome, LeAnna. I think a lot of moms and dads instinctively know preschool is not what it should be. So many talented and experienced preschool teachers have left the profession, refusing to push academic rigor on children who are too young for it. They're tired of championing play, hands-on learning, and socialization, only to be called "old-fashioned." Young teachers are disillusioned when they're told to do the opposite of what they've learned at college and in ECE classes. I think we'll turn it around and move back to play-based preschools, but it doesn't seem like it will happen any time soon. Jessamyn, it sounds like you're on the right track. I love that your daughter is doing forest playgroup. I wish every town had that has an option! It's definitely becoming more popular as people realize the benefits of getting kids outdoors, moving and exploring. Good for you for speaking up at your school for age-appropriate learning. But, the board is doing what so many others are doing these days -- governing out of fear. It's a crazy place where at these days when we need to train/prepare kids for kindergarten. But we're here. It's what's happening. So is the increase in anxiety and depression about teens and children! You so impress me, Jessamyn. You see the insanity, but you're dealing with it and making the proper decisions for your daughter. We need more parents like you. Thanks so much for your response, McKenna! I agree that being sensitive is a gift. My daughter is the kindest person I know of and she has so much empathy and creativity! After talking to her pediatrician and her school we decided that delaying entry into kindergarten until she’s 6 is actually not that unreasonable or even rare in our town. Also, it is not uncommon for kindergarteners to have to repeat...jeez, I wonder why, given that it is a very competitive STEM school in an affluent town. Over the next year I will allow her unlimited learning through play, museums, forest playgroup and libraries! Her co-op preschool disappoints me more by the day. Unfortunately none of the parents on the board value age appropriate learning. Instead they are discussing harsher ways to discipline the kids who won’t sit still. :(. I failed to convince the board that perhaps expecting kids to sit still for 1 hour straight is the problem but I was shut down by the majority who feared that if their kids aren’t “trained” to endure this torture they won’t be ready for kindergarten. I’m glad the school year will be over soon. It’s sad what early childhood edu has come to, but your words give me hope that the pendulum will slowly start swinging back. First, Jessamyn, I commend you for wanting a play-based preschool for your daughter. Too many parents today desire just the opposite--a highly structured and academic program to prepare their child for kindergarten. These moms and dads are parenting out of fear because they know kindergarten is now what first and second grade once were with children being placed in reading groups according to their ability and even being expected to write paragraphs. Common sense has gone out the window. Like your daughter, my younger son went to a preschool that was touted as play-based but was really academic with handwriting books, long circle times, and learning stations. My older son attended a co-op preschool that was truly play-based with none of those things. When my older son was done at school, he was thoroughly exhausted and went home for a nap. My younger son, who had been sitting and listening far too much, was ready for play with his friends. So, when school ended at 11:30, I'd pick him up along with a few buddies and they'd come to my home and play for a few hours. It sounds like your daughter may benefit from that as well. I was amazed how in depth their imaginative play became. I longed for those days when I had such a vivid imagination and felt sad that kids don't have the time at preschool to tap into it. Plus, I'm familiar with all the studies that show how play is so extremely valuable to children's emotional and social development. Since your daughter is sensitive, school (and life) will probably be challenging for her at times. But, what a beautiful trait it is to have a tender heart! I totally understand and sympathize with your dilemma. It's just a nutty time in early education now, but the pendulum will swing back. In the meantime, your daughter is lucky to have you as her advocate. Just realize a lot of what schools expect of students in the early years is developmentally inappropriate and most experienced teachers know it. However, they must reluctantly go along with this accelerated learning if they want to keep their jobs and not get labeled "old-fashioned." Unfortunately, some of the best have left. I wish you and your daughter the very best! I agree with all that is written here, but as a parent of preschool aged girl I don’t know what to do with this information. My daughter is in part time preschool right now and we were under the impression that the preschool was play based, but from what I’ve observed it definitely not. There are only 4 months left so we’re not withdrawing her, but what then? She will be 4 months shy of 6 when kindergarten starts, but kindergarten in our town is full day only and very academic. My child is highly sensitive, I thought about holding her back a year but her preschool teacher said that would be unnecessary and unheard of to redshirt a child this old, however compulsory age is 7 here. Private schooling is not an option and I don’t have what it takes to homeschool. What would you do? As the parent, Chris, you know your child best and want what's best for him. Trust your instincts. I think the most important aspect of preschool is for kids to get excited about learning, exploring, and playing. If that's not happening for your child, I'd say preschool is doing more harm than good. Your child's intellectual curiosity will serve him well throughout his lifetime and you don't want it to get stifled now. I wrote an article called "5 Reasons Why Circle Time Is a Waste of Time at Preschool." There is little benefit in it for the kids. It's more of a showcase for the teachers so they can perform and be center stage. Preschool is dangerous today because it's not seen as its own unique and separate entity. It's now seen as just a way to get kids ready for kindergarten. It sounds like your son would be better off learning at home, having regular play dates, doing activities at the library, and going to children's museums or attending a play-based co-op preschool. Preschools (and elementary schools) are expecting absurd things from little kids these days—behaviors that aren't developmentally appropriate. Then teachers are expected to communicate to parents that something is "wrong" with their child when, in truth, the child is perfectly normal. It's not normal for little kids (especially boys) to sit still for a boring Circle Time. They need to be active learners. It sounds like you have a smart kid on your hands and that will present some unique challenges for you with education. Fortunately, there are more options today and lots of resources online to personalize a program that fits your kid. Good luck! I'm struggling with whether to keep my son in pre-k or not. He's very bright and curious and in the beginning loved to go to "school". The last two months he just doesn't want to go anymore. He absolutely hates circle time and doesn't pay attention to anything. He loves to read, loves numbers, anything to do with electricity, and just discovered the beating heart. ...the real heart. I feel pre-k is a complete mistake for him even though the teachers want to help him. They just don't know how. I'm wondering if the problem isn't him needing help, but they not understanding this lovely child. Sounds good, Sybol. I look forward to reading your thoughts. I am trying to find the words to express my thoughts. I have mixed feelings and yet I agree with the article and many of the comments. I am going to revisit later. You're my hero, Joanna! Keep fighting the good fight and advocating for what young children need. You're exactly right; teachers learn one thing in college and classes and then are expected to do the opposite in the real world. They're not making much money and then get told to do what they know is not good for kids. This creates an ethical dilemma for them with many leaving the profession. Thanks for including your thoughts and experiences! It's not just affecting preschool programs, it has had a severe effect on Child Development Centers too. The rules set by the governors and Department of Human Resources have not taken into account how children learn. They set rules for two-year-olds that are not what all of us have learned in any of the child care classes or college. I struggled daily to find a way to include their rules in my style of teaching. I believe children are active learners and must practice what they learn through hands on play. Most days the rules didn't always make it into my lesson plans, but I refused to change. I will not bring harm to these children who need a chance to spread their wings and be a child. That's a powerful story, Jennifer, and so fitting. Here in Oregon we have one of the biggest high school dropout rates in the country (in 2013 only 69% graduated), but you never hear about it. Instead, Oregon started all- day kindergarten, added pre-k at many schools, and offered more free preschool experiences. We keep adding more of the same, not making it better. We're just giving more and more sawdust to the horse! This reminds me of a story. A man thought he could train his horse to eat sawdust instead of oats, and so save some money. He began gradually to replace the horse's feed with higher and higher proportions of sawdust. Just around the time he had trained it to eat nothing but sawdust, the worthless animal up and died! I so appreciate your comments, Kylyssa. You're so right. Now they even have reading groups -- based on ability -- in kindergarten so kids are already saying : "I'm in the top group" or "I'm in the bottom group." Parents are led to believe that there is a problem with their child if he's not reading in kindergarten, if he needs to move around, if he can't sit still for long periods. There's little acceptance for the truth that youngsters develop at different times and different rates. Thanks for reading and sharing your thoughtful comments! You mentioned that other countries that do not follow the same types of programs see better results. There's a reason for both major elements of that assertion; most other countries have completely different end goals compared to the US. The end goal for education in most other countries is to produce happy people who are good citizens because they understand that such people are far more productive, better educated, healthier, and far, far less prone to commit crimes. Until the US culture comes to accept those truths, it's doubtful progress can be made. The US must come to view children as cherished people, rather than as a consumable resource to fuel capitalism. The end goal for US education is to train people to fit into capitalism as practiced in our culture. Children are taught to sit still for long hours while doing repetitive, boring, frustrating, and often pointless tasks in very specific ways and without questioning authority. In higher grades, children are even taught to do work far, far below their capabilities for hours on end to hone their ability to do what they are told without complaint and at speed even if it's stupid, boring, and pointless. Kathryn -- I love your passion for early childhood education and your respect for the stages of development. It's so sad that some people want kids rushed through these important stages instead of celebrating them. Mercedes -- Your comments are echoed in the excellent documentary, "Race to Nowhere," about the incredible pressures students are facing today. I have a son in high school and I try my best to get him to focus on learning, not grades, but it's nearly impossible. I see young people who worked so hard to get into college, graduated with a degree, and now are working at Starbucks or some other job unrelated to their field. But, most definitely, the solution to this is NOT to burden our young children with accelerated learning and unrealistic expectations. Thanks for reading and good luck in your future! I completely agree. My mom is a first grade teacher at the elementary school I went to and back then ( about 12 years ago) we never had to do any kind of standard testing stuff. Now, they are required to and I see kindergarteners already learning how to write. It's insane how much pressure is put on kids today, including myself. It's mentally draining. I'm a senior in high school and besides all the standardized testing I had to do in previous years, now I have to apply for college. But in order to get into a "good" college you have to have high academic success, a good score on your SAT/ACT, be involved in clubs/sports, and now they have raised the standards because maybe a college that had only required 3 years of math in high school now requires 4. College is also very expensive. There are so many stressed out kids, and some that will even cry if they get a B because now a days B's are just the average. There are some kids out there that even go as far as committing suicide because they can't take it anymore. The education system definitely needs a change! The child is in a second embryonic state from 0 to 6 years. It is a long period of formation and includes universal stages of development. All children go through these stages and need to go through them as a butterfly needs to develop according to nature within it's cocoon. We need to know on a conscious level what is taking place. For one thing it is nature at work. we do not tell the feet in the womb how many toes to grow. We need to respect the process of nature within each child as it forms his psyche / the foundation of the operation of the mind. The psyche is forming itself based on what it absorbs in its environment. It must freely absorb through the senses while interacting with the environment. There is also the aspect of the sense of order / reality which becomes indelible. Whatever the child absorbs into his psyche via the mind and brain it becomes permanent. This powerful ability to absorb can be utilized for positive benefit by creating a conducive environment. But The child ABSOLUTELY needs freedom within it. Boundaries help to create the freedom. This is the basis for the Montessori method. Both books by Maria Montessori, a Doctor of Italy in the early 1900's. She saw children in the light of a doctor and scientist and has helped many with her schools she established. She and others light the true way and must be researched by parents and teachers of today to stay and create the appropriate track for our babies, toddlers and preschoolers. Yes, you're probably right. I see a future where babies are born and immediately placed in "school." They'll be assessed for crawling, crying, and spitting up. Of course, it will all get documented in triplicate. Parents will send their babies to tutors if they're below the mark in any of their skills. The babies will have full access to technology. They'll be told what to think and believe. If they don't conform, they'll be given drugs to keep them in line. Yes, adults are easily impressed when their kids are given technology at school. One mom said to me recently in regards to I-pads at school: "The earlier, the better!" I don't know where parents are getting this misinformation -- surely not from scholars in early learning! Perhaps, the tech companies , who profit from tech at schools, are spreading these untruths. Any way, little children are suffering because of it with poor gross and fine motor skills, limited social skills and vocabularies, and more obesity. Thanks for reading and sharing your experience! Many may not believe all you write, " … too much standardized testing, rote learning, and technology…" for preschoolers! But, I have seen it first hand: In public before / after school (pre-school) day cares where I often sub as head teacher, I say, "These children should not be allowed so much computer time!" the aides look at me like I am out of my mind. I know! That's why I'm not teaching now. 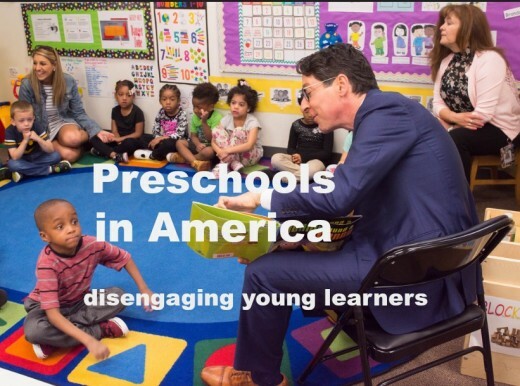 To teach preschool and kindergarten these days, you must remain woefully ignorant of developmentally appropriate practices, common sense, and what's happening in politics.